Most liked in Chicago since Michael Jordan? Derrick Rose is the man! 1st season: Rookie of the Year. 2nd season: All-Star. 3rd season? It’s anyone’s guess to how good Rose can be. Speculation is that a three point shot is in the works for him as well. I’m excited to see the leadership he will bring to this Bulls’ offense. Taj Gibson is also going to have to play well for the first couple of months as Carlos Boozer recovers from his broken hand. The last interesting point I have for this team is who will end up taking the shooting guard position. Ronnie Brewer is good all-around and Kyle Korver has the shooting stroke, but can either make the spot his own? Regardless, Bulls win their division. A new lefty has risen in Milwaukee, sorry Michael Redd. The toughest part for this team will be buying into a rotation that will gel on the court. The Bucks are really deep and this is among one of the better problems one could talk about. The key for this squad to excel is Andrew Bogut. If he can come back strong from the injury he endured last season, I believe the Bucks have a legitimate shot at the second round. Also, the continued development of Brandon Jennings will sure be fun to watch. This kid is still very raw and still has a broken shot, but he is only going to improve and become a top point guard in the league. Thanks to the CP3 injury, Collison has a starting job. This team is my sleeper for the year. Everyone has them finishing 4th or 5th in the division, but I feel that if they can stay healthy and Danny Granger plays like he did in last season, except for 82 games, and Darren Collison also plays like last season, they have a shot at the 8th seed. Call me insane, but this is my crazy pick for the year. Also be on the alert for Roy Hibbert to have a breakout year. He could possibly be a good candidate for the Most Improved Player award. From LeBron James to Jamario Moon. Good luck Cleveland. A natural disaster struck Cleveland and it was the loss of LeBron James. A miracle needs to happen for this team to make the playoffs. Yeah, they have Mo Williams, Antawn Jamison and Anderson Varejao, but without LeBron they are nothing. Almost 30 points per game is lost and there isn’t anyone good enough to fill that spot. I’m sorry Cleveland, but get ready for a rough year. 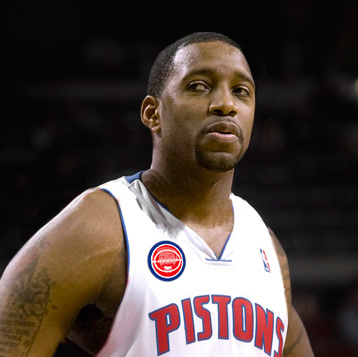 Please prove me wrong, because I loved you, T-Mac! I have no faith in this team. Something about them just doesn’t rub me the right way. Charlie Villanueva had an abysmal debut year in Detroit and injuries plagued them all year long and into this preseason. Ben Wallace is nowhere near to where he used to be as a player back in the glory days of the Pistons, and Rodney Stuckey does not have the playmaking ability to lead this team. Maybe they won’t finish last in the division, but they sure aren’t making the playoffs for a while with the transactions they are making. Cough, Tracy McGrady, Cough. Washed up! The NBA season is less than a week away and many are getting excited for what should be a fantastic thrill ride. I will be posting division previews sporadicly during the course of this week and into the weekend. Stay tuned for analysis on your favorite team, but for now, here is a division breakdown with projected records and the four important awards handed out at the end of the year. Can New York make the playoffs thanks to Amar'e? How will the Cavs fare without LeBron? Wall and Arenas will be a fun duo to watch! How many games will Yao play in? My pick for the NBA Finals is Lakers over Heat in a seven game series. Here are the awards for the end of the season. Melo to the Pistons, Billups-Rip-Prince Back Together? Believe it or not, as good as John Wall is, his numbers will suffer much like the “Miami Heat syndrome”. With both Kirk Hinrich and Gilbert Arenas on board, his numbers across the board may suffer but that’s perfectly okay. Having two solid, veteran guards around the top pick will help develop his overall game and they should help relieve some of the pressure. After watching the Pacers play in Orlando Summer League, I got to say I thought Lance Stephenson would start, but since then a variety of different things took place. The Pacers acquired Darren Collision, Brandon Rush was suspended 5 games, and the biggest issue was of course Stephenson getting in trouble with the law. After digesting all that took place in the course of just one month, it looks as though Paul George will have a nice opportunity to earn the starting shooting guard spot to start off the season. 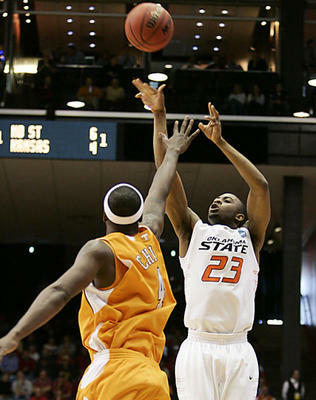 If George does in fact beat out Dahntay Jones for the starting role, expect to see George put up a fairly decent line. The biggest concern with George is retaining some consistency game-to-game he struggled to keep his shooting touch throughout Summer League, but that’s common among many rookies. If he does in fact earn a 1st Team honor at the end of the season, his numbers won’t overly impress you but his value to his team’s success could play a big factor if the Pacers make noise next season. Even with the offseason addition of Martell Webster and Michael Beasley, the Wolves will find time for their top pick in Wesley Johnson. Say so long and farewall to former Wolves lotto-pick Corey Brewer, he’ll remain on the trading block until someone bites. Call me crazy, but I wouldn’t be surprised if David Kahn ends up packaging Kevin Love along with Brewer. Earlier this summer Love told the media he didn’t feel appreciated in Minnesota and he may continue to feel that way if Beasley turns his career around with the Timberwolves. Look for Kurt Rambis to move Beasley to the power forward position, allowing Johnson to operate in the starting small forward role. 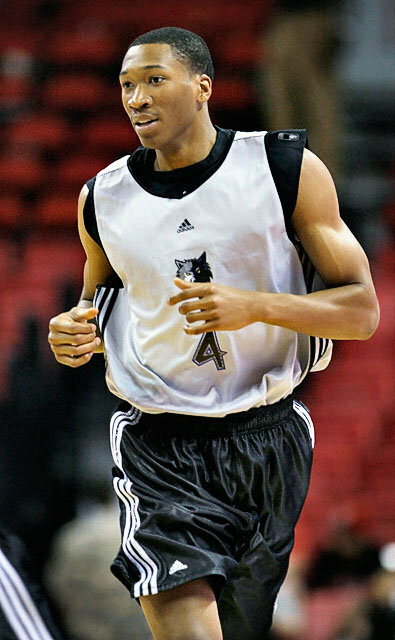 Quite possibly my pick for the 2011 NBA Rookie of the Year, Why? There’s no doubt Greg Monroe will be in the Pistons’ starting five next season. Preferably at the power forward spot, but with Charlie Villanueva on board, it may force Monroe to move to the center. But nonetheless, Monroe was very impressive in Las Vegas Summer League and looks to be a NBA-ready force that can make big contributions during his rookie season. If Monroe can live up to my words, the Pistons might not be so bad after all. 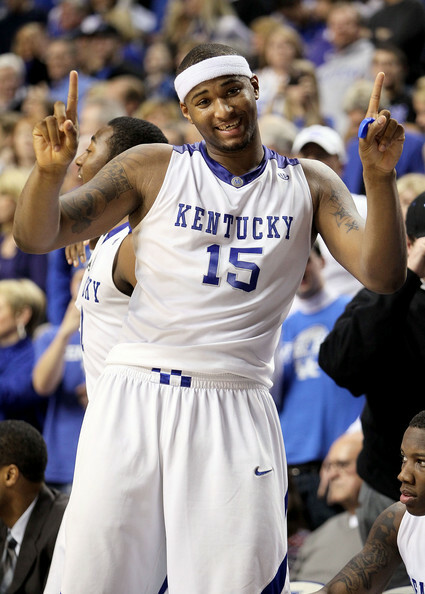 Although the Kings frontcourt is filled with talent, DeMarcus Cousins is the cream of the crop. His size, strength, talent, and potential are unmatched in the post. Much like Tyreke Evans, Cousins should find success as the newest member of the Sacramento Kings. Definitely will be in the Rookie of the Year discussion at the end of the season. This is Part 3 of Ross Geiger’s 7-part Blog Series covering the NBA’s most prominent young players. Be sure to be on the lookout for Part 2 that’s coming soon! In the mean time, follow Ross Geiger on Twitter: @RossGeiger. The OuttaTownClowns would like to welcome Zach Silvernail to the blog, we’re happy to announce he’s the newest edition to our growing blog. Zach will primarily focus on contributing to our NCAA Basketball and NBA content on the page. Along with his well-written work, Zach has a great knowledge and high level understanding of the game at both the collegiate and pro levels of play. But don’t take us from us, follow his work on our blog and you’ll see for yourself. Without further ado, I bring you Zach’s debut post on the OTC…Enjoy! I know, I know. He’s getting older now, and does a lot less high flying than he did during his mini-fro days, but he is still one of the more explosive and acrobatic players in the league. Don’t think so? Dare you to tell him otherwise. Talk about a FREAK athlete. Rose is one of the most, if not the most explosive two-foot jumpers in the NBA. He might not belong in the top 10 based on his quantity of posters, but certainly for his quality and capability. Goran, what were you thinking? Following in the footsteps of former Wildcat high-flyer Richard Jefferson, “Iggy” comes in at number 8. With deceptively long arms, incredible athleticism, and an underrated array of dunks (as illustrated in his dunk contest appearances)…Andre had to make the list. This guy might be my favorite one on the list. 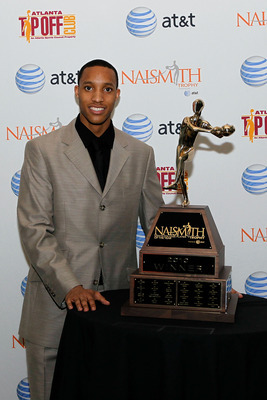 He became known for his ability as a youngster at UCLA, and has continued to humble opponents in the NBA. One of the top five quickest and fastest players in the league, he is beyond dangerous in the open floor. Now the ranking becomes a little bit more difficult. It’s hard to put Rudy as low as number 6, but he has about 84 million reasons to make himself feel better. Almost impossible to stop above the rim because of his length, and probably best known for his always fully extended, and picture perfect windmill. "Mr. Tolliver, will you sign my poster?" Amare is certainly one of the most ferocious and powerful dunkers on the list. He may not always have the most “spectacular” posters, but he seems to have about a million every year. His number of dunks might go down without “Stevie” to thread the needle this year, but he’ll still manage to embarrass a few opponents and their families. Somewhere Anthony Tolliver is tweeting: “SMH”. Alright, now it’s almost impossible. Having to put maybe my favorite player at 4 was not easy, but the top 3 are too good. “DW3” is as relentless as anyone when it comes to taking the ball to the rack, and epitomizes the clique: “attacking the rim with reckless abandon”. Just ask Anderson Varejao. “J-Smoov” needs no introduction. Only fitting that he would play for the Hawks. Probably the only guy capable of filling out all Top 10 plays on SportsCenter in one night. 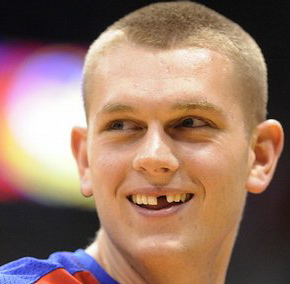 He’ll pin you at one end and then catch a lob on the other. Always fun to watch. Superman comes in at number 2 strictly because it happens so often. Had the list been called Most Likely To Dunk on You…Dwight would probably be number 1. Not only one of the most incredible athletes currently in the NBA, but of all time. Are you surprised? Possesses every possible attribute of a good poster-er. Size, speed, strength, quickness, jumping ability. You name it, he’s got it. Well, except for a ring. Well, that concludes my list. But, before I go, just want to give a shout-out to the All Underrated Poster Squad: Will Bynum, Ronnie Price, Von Wafer, Shannon Brown, Dahntay Jones, Chase Budinger, Rodney Carney, Trevor Ariza. After watching the Milwaukee Bucks lose a tough one in a very exciting battle with the Dallas Mavericks in their Summer League opener, I came away with five players that are worthy of some points of emphasis. 1. Darnell Jackson: Leading all scorers with 17 points in the contest, Jackson’s NBA experience really paid dividends. Going 8-15 from the field while collecting 7 boards all came under composure. Many of the young players came into the game with debut butterflies but it was evident that Jackson’s adapted to the summer league experiences. He led by example in 25 minutes of play and played under control the entire time, only committing 2 fouls as well. It’s still very early in a long process but his Game 1 play definitely helps his case in grabbing one of the last few spots on the Bucks roster this season. 2. Larry Sanders: Despite what many take from Sanders’ pro debut, I actually feel I saw more positives than negatives today. Yes he struggled offensively but we knew that was his biggest weakness coming in. Having only connected on 4 of his 15 shot attempts Sanders must improve upon finishing at the basket while absorbing contact, along with better shot selection. As far as the shot selection goes, that can easily improve as the games move on, he was trying to impress as any brand new top pick would in their debut. But as I mentioned there were tons of positives from this year’s 15th overall selection. Sanders is very active on both ends of the floor, alert at all times, and always attacking the glass. Those intangibles are things that will most definitely find him earning some floor time under Bucks Head Coach Scott Skiles this year. Though it’s only one game and my first look at the Bucks rookie if I were to give you an outlook on Sanders’s first year with the Bucks here’s my evaluation: He’ll play spot minutes, be a spark plug used at the end of quarters giving guys quick breathers, instant energy. A very realistic first year comparison in terms of production and play I’d say he’ll be a lot like Suns forward Lou Amundson. With that being said, he obviously carries way more potential and talent moving forward with a bright future in this league. Just be patient and give him some time to transition and adjust to the NBA level of play. 3. Sean Williams: Being a guy always high on the potential of Area 51, I definitely won’t count him out on making an NBA roster this season. If he can prove (and keep) his head on straight (which is a big if) there’s no question he’s an NBA type talent. He’s long, runs the floor like gazelle, can clean up around the rim, and of course he lives up to his nickname “Area 51” protecting the paint by swatting away shots. What I liked in his first game with the Bucks was his patience, his control, and his willingness to move the ball. On top of that he impressed me with his 15 foot look that he drilled and also threw his body around a bit and took two charges. Williams has a great sense of when and when not to attempt to block a shot, he stays grounded at the right time and tends to pick the correct times to challenge a shot attempt. That feature of knowing when to block a shot could really benefit Bucks draftee Larry Sanders who doesn’t have the slightest clue when there’s a time and a place to leave his feet. Bucks fans, it’s a long shot, but don’t count out Williams on maybe earning that last roster spot. I wouldn’t bet on it, but his talent is intriguing and if there’s any organization that can help Williams change his off court habits it’s in Milwaukee. There’s no doubt the Bucks are great situation for Sean Williams future, the question is whether or not Williams is worth risking the team’s locker room atmosphere. If Xavier Henry or Paul George would have fallen to the Bucks at 15, I think Sean Williams maybe makes the team. But with Sanders on board, along with Tiny Gallon whose close with Brandon Jennings, I see Williams unfortunately not getting his second chance with the Bucks. 4. Deron Washington: A second round draft pick of the Detroit Pistons in last year’s draft, Washington’s got an idea of what summer league’s all about this year. That showed in today’s game as Washington went 4-8 from the field, hitting 1 of 2 attempts from downtown, and 2-2 from the charity stripe. His contributions helped keep the Bucks in the ballgame and he hit some big shots. Washington finished with a solid 11 points, 8 rebounds, 2 assists, to go along with 2 steals. With continued play like this, Washington should find himself a nice look overseas next season. 5. Dominic James: The former standout point guard from Marquette is entering his redemption year after suffering a summer league ending injury just a day or two before he was set to participate in summer league last year with the Bucks. James didn’t have a pretty game by any means but his hard nosed, full court pressure defense and his efforts in getting good looks for those around him gives him my nod for my 5th and final spot. His highlighted plays include a buzzer beating high fade away jumper to end the first quarter of play, a nice no look dish hitting Darnell Jackson after drawing too, and his hustle play in which he sprinted all the way down on the defensive end, ultimately sacrificing his body leaping over the media table on the baseline. James isn’t quite a NBA level talent, but this type of play will definitely help his chances overseas, giving him more better opportunites in the future. I’m sure we’ll see Mr. James on an NBA Summer League roster next year as well. In the end, it’s great to see the Milwaukee Bucks giving exposure to Wisconsin area players: Dominic James, Jerry Smith, and Franklin. The Bucks look to bounce back from their overtime loss against the Dallas Mavericks tomorrow against the Memphis Grizzlies. Game time is set from 8 ET and will be televised on NBATV.